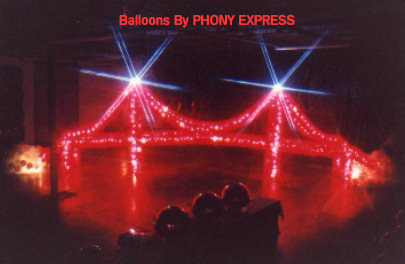 4000 balloons form a 40 foot, fog enshrouded "Golden Gate Bridge" with strobe light towers, internal twinkle lights, and chase light motion for traffic. The bridge was the centerpiece for a "Streets of San Francisco" theme event. 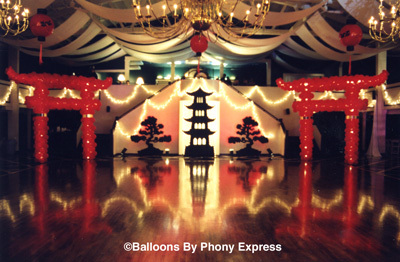 Oriental "Torii Gates" form glowing balloon entrances for guests at the Valley Dale Ballroom, while two bonsai trees, a pagoda prop and Chinese lanterns made from 3-foot balloons add to this "Mysteries Of The Orient" party. Two 40-foot "fire breathing" balloon dragons (not pictured) snaked down from the balcony onto the stage to the sides of the DJ. 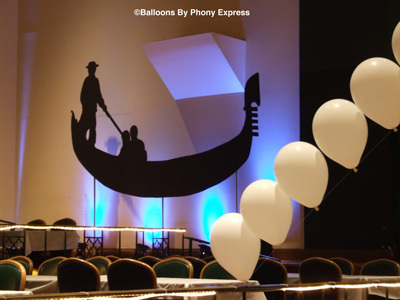 A Venetian gondola silhouette prop, shown here back-lit with floor spotlights, is among our large selection of theme props. 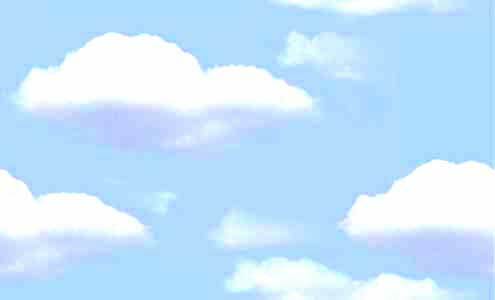 Please feel free to contact us to discuss these or other themes, or how balloons can be used to enhance your next event.